Inter Milan have completed the signing of former Arsenal midfielder Patrick Vieira from Juventus for £6.5m. The 30-year-old had been linked with Manchester United, but has now signed a four-year deal with Inter. Vieira joins the exodus of players from the troubled Italian side who have been relegated to Serie B for their part in Italy's match-fixing scandal. 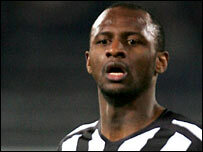 The sale represents a big loss for Juve who signed France midfielder Vieira from Arsenal in July 2005 for £13.7m. "I am very happy, I am very pleased. Inter really wanted to sign me and this was a decisive factor for me," said Vieira. "I am convinced that Inter can do very well, and that I can do very well here. "I wanted to continue to play at the highest level, I wanted to continue to play to win a lot and this was the reason why I chose Inter, who have great players and great potential." Vieira becomes the latest player to leave Juventus after the club were relegated to Serie B for conspiring with referees and linesmen to rig games during last season. Emerson and Fabio Cannavaro left in July for Real Madrid, while Gianluca Zambrotta and Lilian Thuram headed for Barcelona. As well as dropping a division, Juventus have been told they face a 17-point deduction to start the 2006-07 campaign. Inter were awarded the 2005-06 Italian league title last week after a sports tribunal revoked Juventus' title win. The club have lodged an appeal against the penalty to CONI (the Italian Olympic Committee), the highest sporting body in Italy. By joining Inter, Vieira will play for title contenders in Serie A and will also take part in the Champions League. Vieira built his reputation in England with Arsenal, moving to the Gunners from AC Milan in August 1996. Under French coach Arsene Wenger, Vieira won three league titles and four FA Cups during his time at Highbury.